The camel for sure. I love it! I’ve never owned one, but I’ll have to try it out. It’s just so hot here Miami most of the year. I barely, got to wear my cool snow boots I bought. I had to have these snow boots just in case. Maybe I need to book more trips up north, so that I can wear pretty coats like this and my snow boots. XO LOL! You’re right though, a nice jacket like this is a great investment and will last for many years to come. I’d go for the black one! Especially if you already have a camel colored Burberry trench! I only have one oversized blazer and LOVE it. I wear it all the time – especially to dress up simple skinny jeans. Maybe I just need to invest in a second one because that camel one is to die for! Love it, I have a few of the vintage variety but need to invest in a nice camel shade. I couldn’t agree with you more. 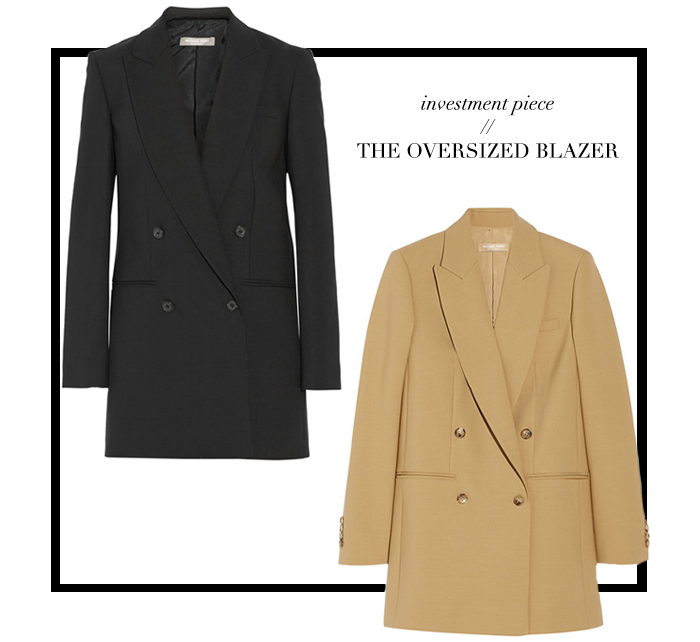 Investment pieces should always be closet staples!! I really need to start looking for a blazer thats not black ;) Love this post Merritt!! I think with your skin tone the camel one would look amazing! I couldn’t agree more about investing in classic pieces! My personal favorite is handbags but I can never have enough blazers and jackets! I love your choice here – it will be perfect year round! I love them both – can’t go wrong! So true about investing in style! And the great thing is they’ll tailor it to fit you to perfection. I’m more into black, but go with the one that will match with most of your wardrobe. I love these. I think I would have to go with the black, because a light colored investment piece is probably not in my best interest, lol!